Alas, and alack. For today I lost a good and faithful friend. It has been with me this past 5 years and has been grafting hard for 8 years and 76,204 miles. It hasn't been an easy life. It has endured cold winters. There have been early starts and late finishes. Rain so hard the road was more like a river. Hot summer days too. Rough roads where it would be shaken and jolted. Long long motorway hours. It only ever failed to shine twice before and that was through no fault of it's own, that cursed stator coil was the culprit. It has been to Ireland and Scotland and Wales and The Netherlands. It has been all around the UK. It has been on display at bike shows and it has been locked up and abandoned for weeks at a time. All through these trials and tribulations it has remained quietly stoic, resolutely doing it's thing without complaint or attention. It was always there, just there, going unnoticed because it never asked for anything more than a flow of electrons. But now, well now everything has changed. Today it lost it's shine. Today while the bright brake element was working the less showy but harder working aspect we call the tail light element was no longer, it was gone, the sparkle had left it's wires. It was physically easy to replace but emotionally I may never be the same. Never in the field of motorcycle stop n tail bulbs has so much been owed by one motorcyclist to one bulb. Alas, poor stop n tail bulb, I knew it so well. I will be holding a brief service at tea time. It will be a short and simple affair as I commit the remains to the wheelie bin. Thank you dear Stop And Tail bulb. While I am the king of tightness even I have to admit...I'm ashamed to say...I...cannot fix the inner workings of a bulb. I hang my head in shame. Led bulbs are the way to go, particularly on smaller bikes with lower output alternators. The initial expense may be higher (cringe), but replacing the tail/stop light, instrument lights and if required, indicators, frees up precious watts for powering the headlight and ignition. It's a bulb! Just a bulb! Is it me? It usually is. Had both dip beams go on mine in EU, thankfully the mains and side held out. Don't you love changing headlight bulbs on faired bikes? Two minutes to pop the bulbs in. 4 hours to remove and refit plastics and then figure where that remaining screw should have gone! 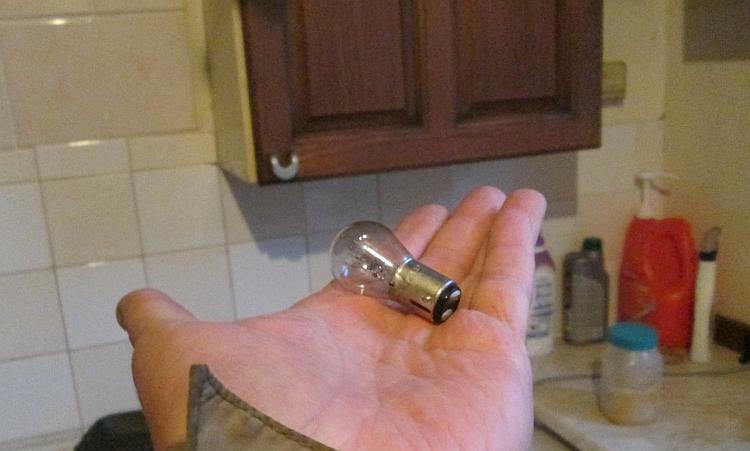 But, it's just a bulb. No burial required. The CBF125 has a peculiar half wave rectified output to the tail, head, side and clocks lighting circuit. One half of the single phase alternator output wave is used to charge the battery which feeds the stop light and computer. The other negative half of the wave powers the running lights circuit. I can run an LED bulb in the side light but it does not last long at all due to it being switched on and off constantly (the half wave). There are plenty of forum posts showing how to combine both waves to charge the battery and then using the fully smoothed power from the battery to run the running lights - as most motorcycles are. But I'm working on the principle if it ain't broke then don't go fixing it. Oh and if you've done some work on the bike and there aren't a few bits left over then you've done something wrong. I'd be complaining to the dealer, surely that's a warranty item? Write letters to the manufacturer threatening them with exposure on your "popular international blog"
Remember it's the squeaky wheel that gets the grease....... or is that the greasy wheel that gets the squeak. Hehe!! Yes Glenn I wonder how far I'm going to get with my local Honda dealer with that warranty claim. "popular international blog" you say? Why thank you. I bet Honda would be quaking in their boots. Or should that read quacking? Probably quacking as it sounds a little like laughter.